I received this as a gift and was instantly impressed with the size and cut of this unique "stone". It is a conversation piece to say how amazing it is that a stone so beautiful comes from polished lava! Lightweight and dainty yet sturdy setting with sparkle for days! Definitely worth every penny. My mother bought this recently because she loved thee color and the big stone. She loved the story behind the stone, too. It's a big ring, but not awkwardly so. It looks better than the photo. It's a beautiful color. Even more beautiful than pictured. Very well made and the center stone is huge. The color is clear, and lights up in a brilliant show of dark green. Looks far more expensive than it is. I live in Washington so wanted a little of our Mt. St Helens. Man and nature collaborate to create a glamorous green ring guaranteed to rock her world! From that chaos, something beautiful emerged a spectacular new creation named Helenite. 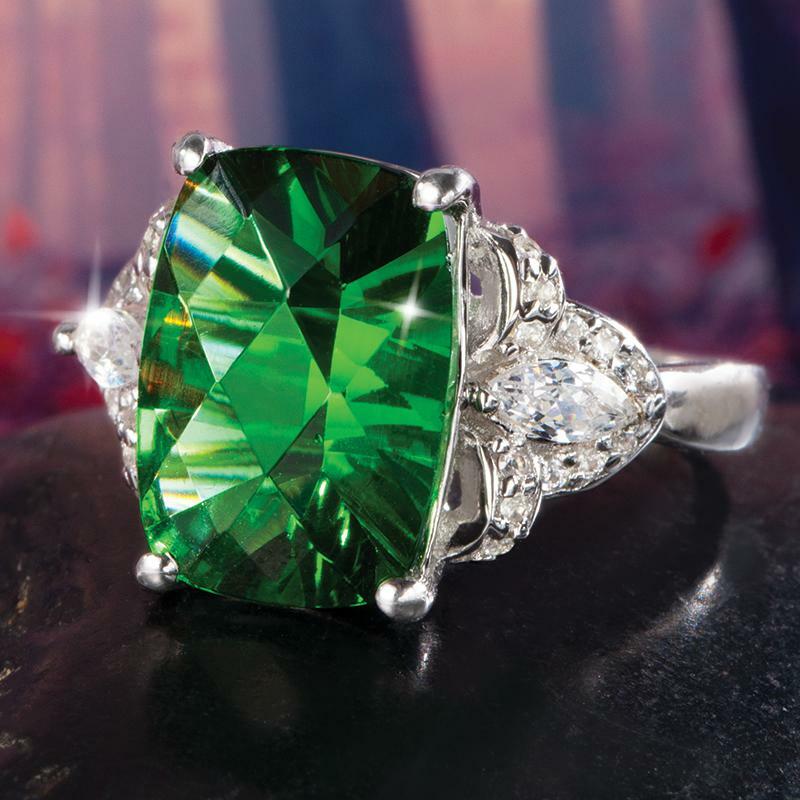 Produced from ancient minerals that erupted from inside of Mount St. Helens, this brilliant green creation has captured the attention of jewelry designers worldwide. But there are some things you need to understand before you bring home a "piece of the volcano." Our new Spirit Lake Helenite Collection reverberates with a remarkable green fire that can become mesmerizing. The 4-carat helenite centerpiece displays a color and clarity that rivals some of history's greatest gems. You can blame the unique, concave cut for the extra brilliance. Expertly polished facets don't let a single ray of light go to waste. And the .925 sterling silver shoulders are loaded with brilliant white, lab-created DiamondAura®. Our Spirit Lake Helenite Collection honors the raw power of nature, and the glorious spirit of rejuvenation.